From the estimation of 10-year cardiovascular disease risk to the calculation on echo of a shunt fraction, cardiology is a field riddled with formulas and scoring tables. 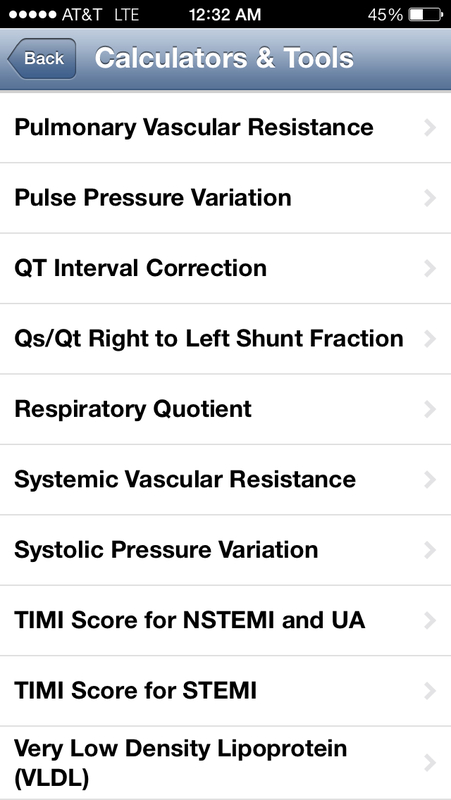 So while apps like QxMD Calculate are great as a general calculator, it makes a lot of sense that an app geared towards cardiologists that has all of the equations and scores that no non-cardiologist would ever want to know would be useful. That’s the need that Epocrates Cardio Tool aims to fill. Unfortunately, after giving it a spin, it left me with a distinct feeling that the app was more intended to bolster the ranks of cardiologists amongst Epocrates’ registered users rather than to function as a tool for the average cardiologist. Part of that feeling comes from the detailed registration form, which left me thinking that I was going to have to promise my first born for access to the app. Thankfully, they stopped short of that, but not before getting the details of my medical training and current practice. I’m not naive and so I know this is the price to be paid for getting a high quality app for free. So when I landed on the app’s home screen, my expectations were high. 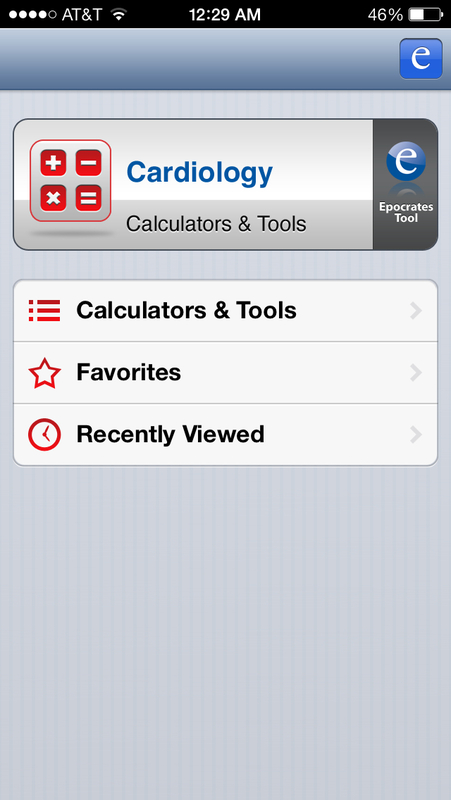 We’re presented with three options initially–Calculators & Tools, Favorites, and Recently Viewed. 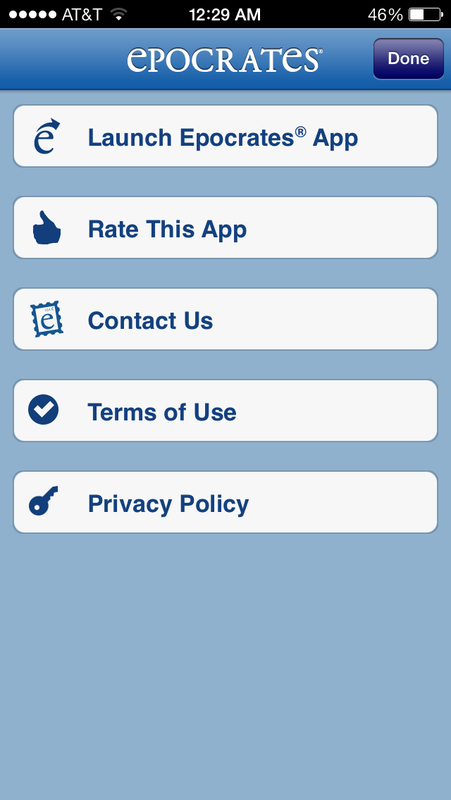 Overall, the app itself is certainly well designed and easy to use. Going into the Calculators & Tools section, there are about 25 options listed. I was puzzled by the selection of calculators that were included. 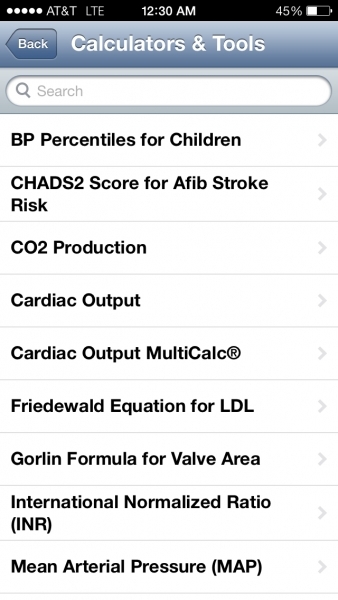 For example, a calculator to determine the LDL-C based on the Friedewald equation is included. Personally, I can’t imagine a lab would run a lipid panel with the total cholesterol, triglycerides, and HDL but then provide this calculated value in the result. The same is true for the included INR calculator. There are also several notable formulas missing. 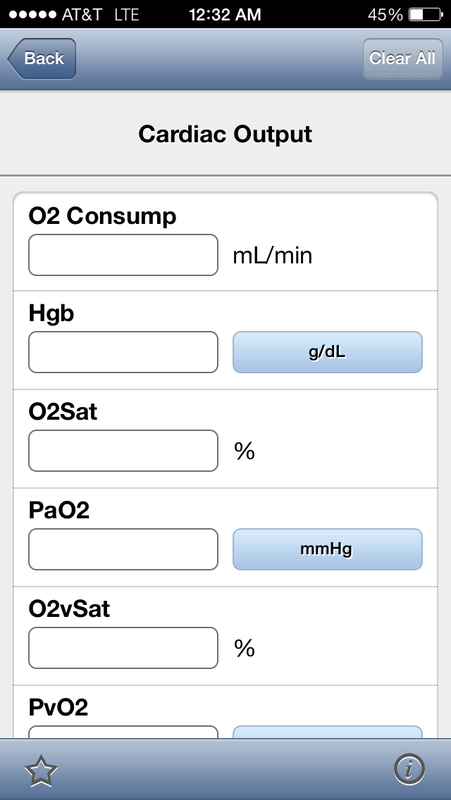 While the TIMI score is included, the GRACE score, contrast nephropathy risk estimation, CHADS2-VASC, HAS-BLED, Framingham risk, and many other useful tools are missing. Also of note is that the 10-year ASCVD risk calculator, released in the updated 2013 lipid management guidelines, is missing. 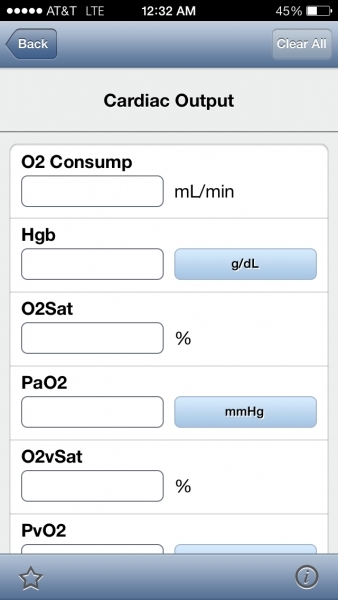 That being said, there are several calculators here that I have not seen in any other apps, particularly broader calculators like QxMD’s Calculate. Each calculator and tool includes two options–the ability to label it as a favorite and an information button. 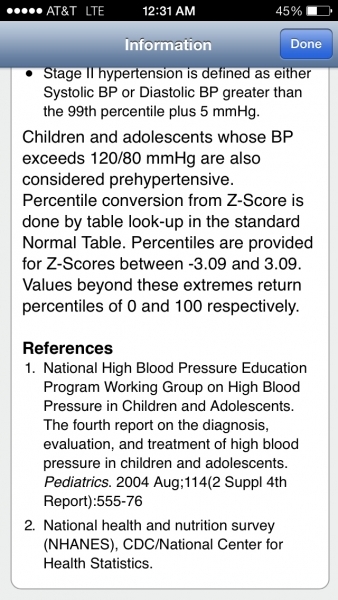 Each entry is basically structured in one of two ways–either with entry fields for patient-specific data generally for calculators or a select all that apply list generally for risk scores. However, the information provided is variable. 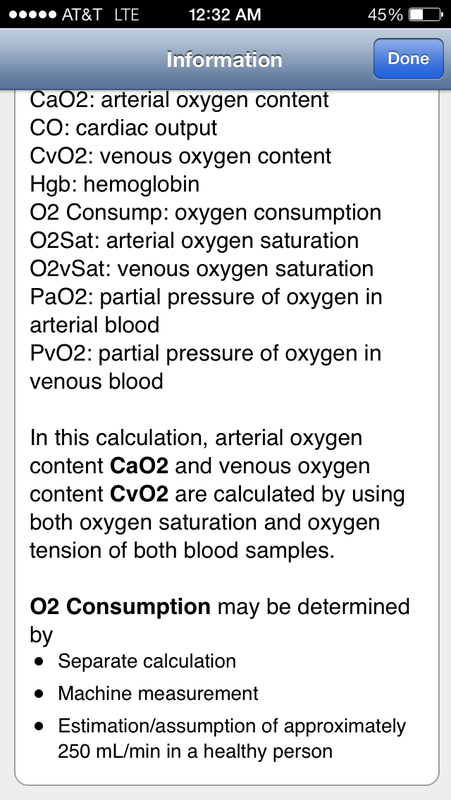 The oxygenation index calculator includes a succinct statement about the utility of the index whereas the pulse pressure variation calculator does not. 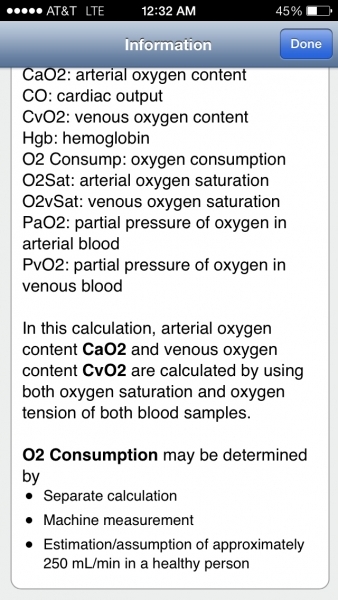 References are generally present here for the included calculators and tools, but not always. 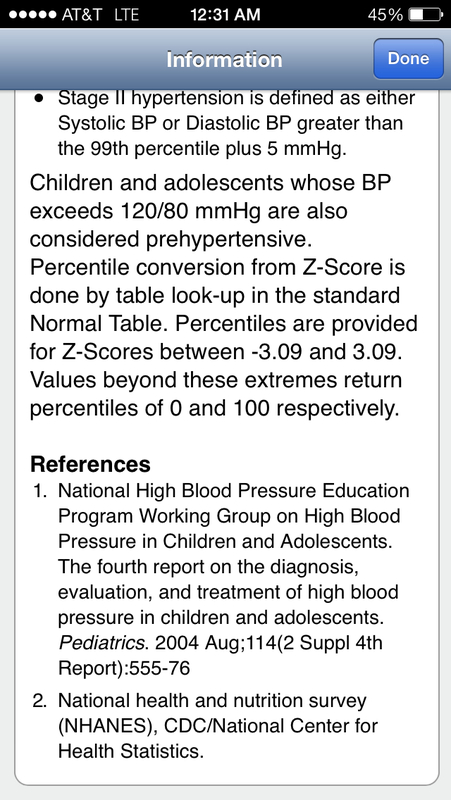 The BP percentiles for children, QTc, and Qs/Qt all have it but the O2 consumption, CO2 production, and cardiac output do not. It is not clear to me why some have references while others do not. 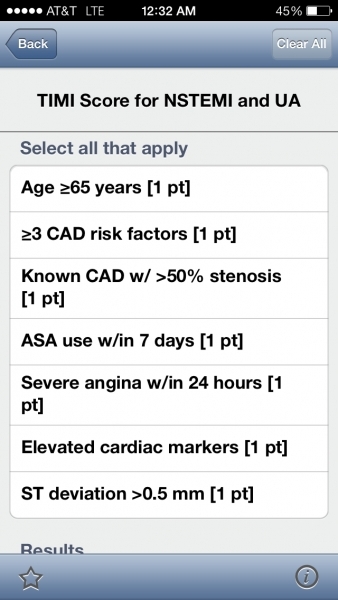 Overall, this app falls short as a point-of-care tool for cardiologists. Its selection of formulas is limited and seemingly random. Referencing is inconsistent as is the information provided for each calculator and tool. 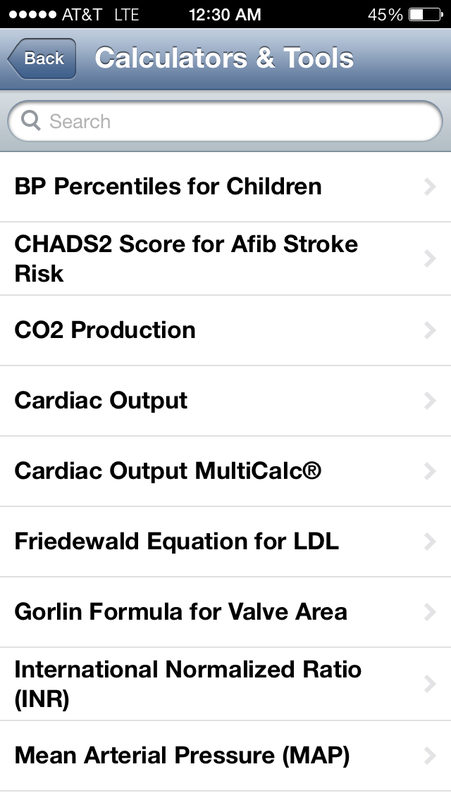 The app does have some calculators that you may not find in other apps, so there may be a subset of cardiologists who will find use for the app. 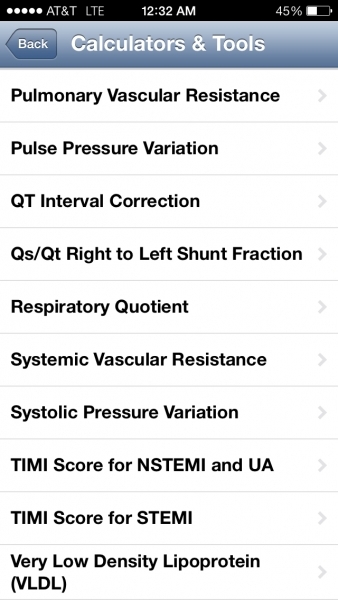 Otherwise, this app needs work before it will be useful to most cardiologists. The privacy issue is one that each user will need to make a personal decision on.